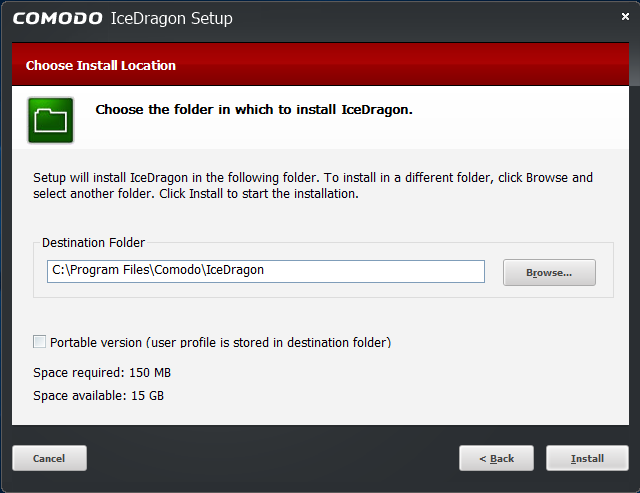 Comodo IceDragon can also be installed in portable mode. As the name suggests, portable mode allows you to install Ice Dragon on a USB stick. You can then quickly launch and use your personalized version of IceDragon on any computer without needing to install, import bookmarks or modify settings. In portable mode, the user profile (configuration data) is written to the IceDragon installation folder instead of the Windows ‘user’ folder on the local machine. By simply copying the installation folder to another drive (such as a USB stick) you can launch and use your personalized Comodo IceDragon. User profile is stored in the "User Data" folder inside the main Comodo IceDragon installation folder.